In an entertaining showdown, Fenerbahce Ulker Istanbul finished the 2014-15 Turkish Airlines Euroleague regular season in style by downing FC Bayern Munich 87-81 at home on Friday. Fenerbahce was second in Group A with an 8-2 record while Bayern was fifth at 2-8 and will join the Eurocup Last 32 in early 2015. Bogdan Bogdanovic led the winners with 16 points. 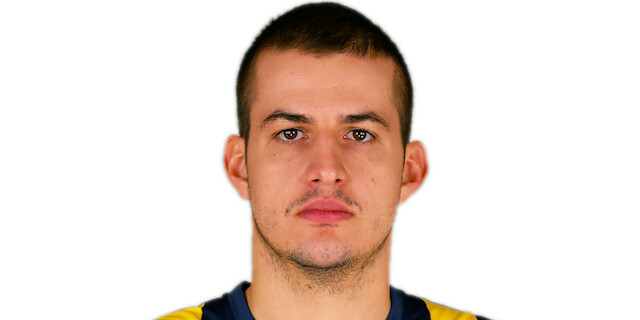 Oguz Savas added 15 while Nemanja Bjelica had 14 for Fenerbahce. Bogdanovic, Savas and Bjelica combined for 16-of-17 two-point shots. Nihad Djedovic led Bayern with 19 points. Bo McCalebb added 16 while John Bryant had 11 for the guests. A three-pointer by Anton Gavel gave Bayern an early 5-6 lead. Fenerbahce found a go-to guy in Bogdanovic, who had 10 quick points to make the hosts get a 21-16 after 10 minutes. 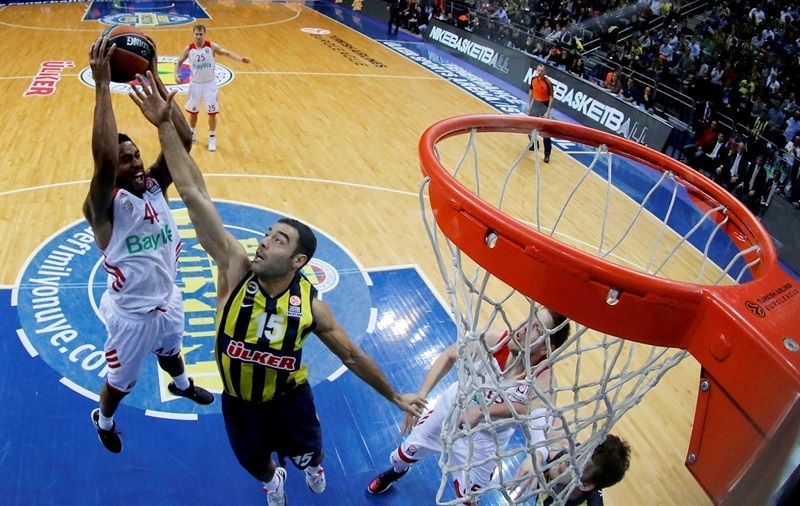 Oguz Savas and Nemanja Bjelica stepped up in the second quarter to make Fenerbahce survive a rain of three-pointers. 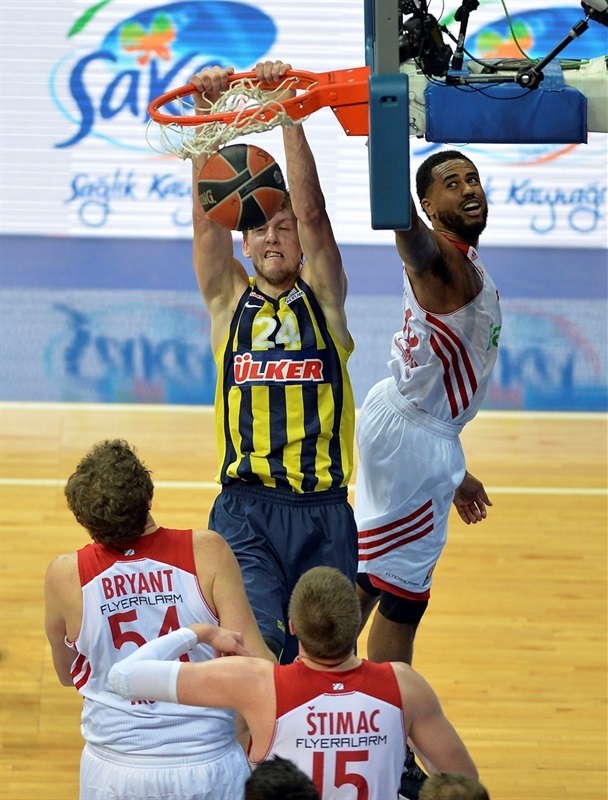 A layup by Jan Vesely fixed the halftime score at 42-33. Fenerbahce limited Bayern to 4-of-21 two-point shooting and 11 turnovers, but the guests had nailed 8-of-14 shots from downtown. Nothing changed after the break, as Fenerbahce kept a 64-56 margin after 30 minutes and extended it to 80-69 to seal the outcome. 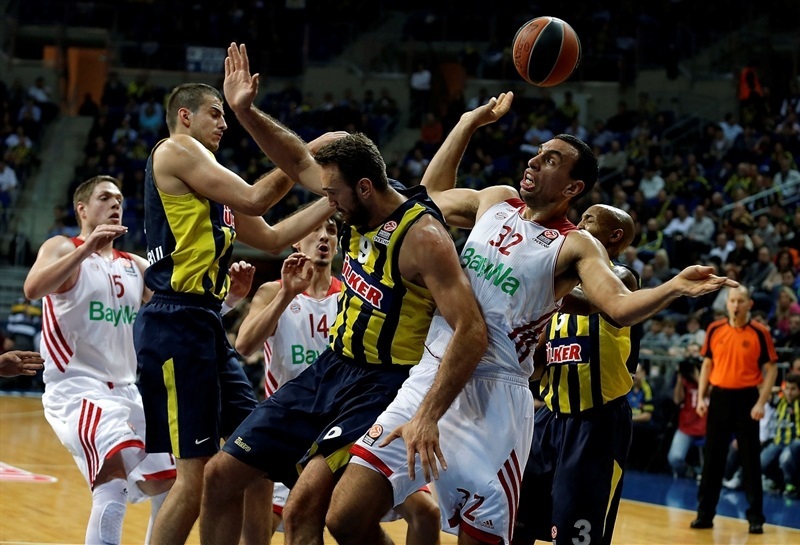 Semih Erden got Fenerbahce going with free throws, as Bayern was held scoreless in the opening two minutes. A three-point play by Emir Preldzic gave the hosts a 5-0 lead. McCalebb struck from downtown and Gavel also hit one from beyond the arc to give the guests their first lead, 5-6. 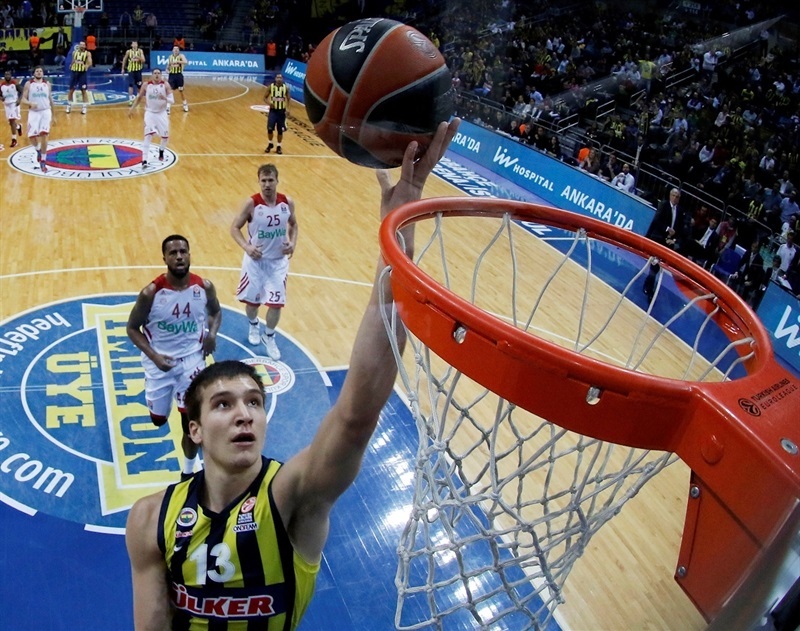 Erden dunked and back-to-back fast break layups by Bogdanovic restored an 11-6 Fenerbahce lead. Bryant split free throws and a dunk by Jan Vesely made it a 6-point game. After Bogdanovic nailed a corner triple, Bryant hit a jump hook. A layup by Dusko Savanovic brought the guests a bit closer, 16-11. Andrew Goudelock made free throws, but Bryant scored again. Another three-pointer by Bogdanovic boosted Fenerbahce's lead to 21-13. Savanovic answered from downtown to fix the score at 21-16 after 10 minutes. Savas nailed a close jumper early in the quarter and soon added an off-balance layup-plus-foul which made it a double-digit game, 26-16. Heiko Schaffartzik struck from downtown, but Savas scored again. A three-pointer by McCalebb gave Bayern hope at 28-22. Bryce Taylor joined the three-point shootout with one off the glass. Bjelica scored in penetration, but another triple, this time by Paul Zipser, got the guests within 30-28. 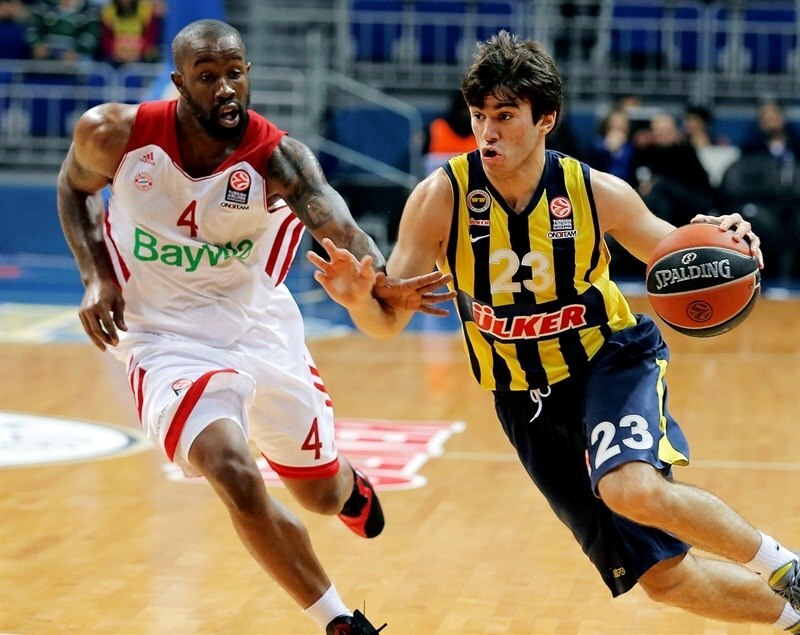 Bjelica kept pacing Fenerbahce with free throws and Ricky Hickman gave the hosts fresh air at 34-28. Djedovic nailed one from beyond the arc and exchanged layups with Bjelica to make it 36-33. Goudelock shined with a driving basket, which Bogdanovic followed with a fast break layup for a 40-33 margin. A power layup by Vesely boosted the hosts' margin to 42-33 at halftime. Bryant scored around the basket soon after the break and a one-handed floater by Savanovic made it 43-37. McCalebb found space for an uncontested layup, which Vesely matched with a dunk. Savanovic fed Bryant for a layup. Erden split free throws and a three-pointer by Gavel brought Bayern as close as 46-44. Vesely provided a highlight with a wild one-handed slam, but Bryant answered with free throws. Hickman struck from downtown, but a layup by Vlado Stimac kept the guests within 51-48. Preldzic scored around the basket and a driving layup by Hickman kept Fenerbahce way ahead, 55-48. Savas scored down low, but Savanovic and Djedovic combined for 6 quick points to get Bayern within 57-54. After Serhat Cetin nailed a three-pointer, Preldzic and Djedovic traded baskets. 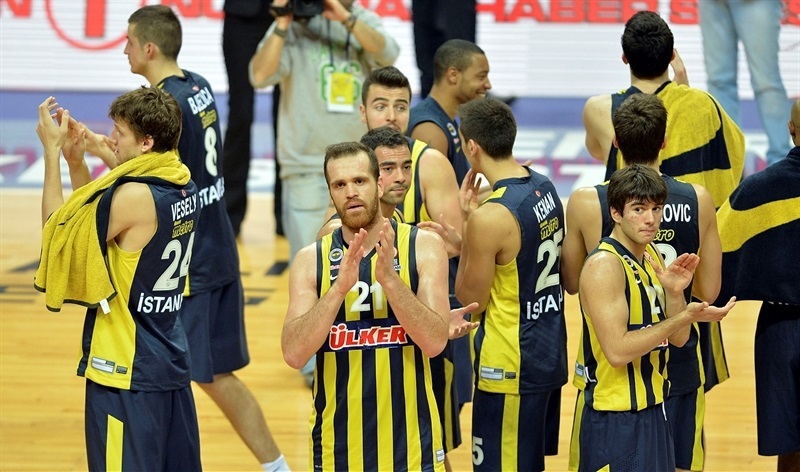 A driving layup by Bjelica gave Fenerbahce a 64-56 advantage. Cetin shined with a fast break layup which Bjelica followed with a tip-in to cause Bayern to call timeout at 68-56. McCalebb fed Stimac for a layup and soon split free throws to bring Bayern a bit closer, 68-59. Djedovic took over with a driving basket which Berk Ugurlu matched with a floater. Bjelica stayed on fire with a high-flying layup-plus-foul that McCalebb matched with a three-pointer. Bogdanovic buried a turnaround jumper and a big basket by Savas saw Bayern call timeout at 77-64. McCalebb swished a mid-range shot, which Djedovic improved with a triple for a 77-69 Bayern deficit. Bjelica split foul shots and a fast break dunk by Bogdanovic sealed the outcome, 80-69, with over three minutes left. Bayern never gave up, but Fenerbahce kept full control of the game and cruised to a well-deserved win. "First of all, I am very happy that we had great support from our fans tonight. It didn't matter that the game was not important. I told the players before the game, we must respect ourselves and the people who are coming to support us. It was logical to think about the game that we have to play on Sunday and give everyone the opportunity to play. I am satisfied with this part of the Euroleague. The goal was to be in the Top 16 and now let's say that everything starts again. From our experience last year, we must understand that we will play 14 games and they will be very, very tough. Congratulations to our players, because this was a good result, and also to our fans. We are together in everything and must continue like that." "Congratulations for this victory to Fenerbahce. It was the same game like in Munich. 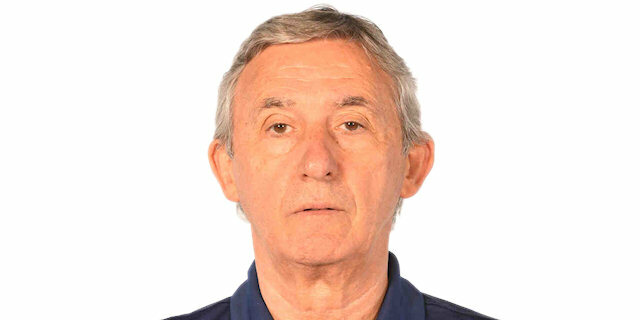 We had our chances, but I wish Coach Obradovic and Bjelica success in the Top 16 and, of course, to win if it's possible, the Euroleague. 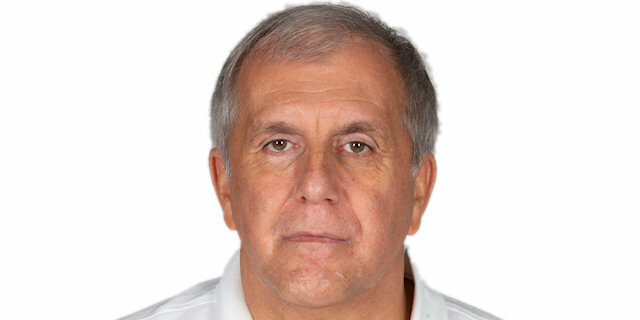 If they are in the situation to win Euroleague in this season, then I wish Zeljko, Bogdanovic and Bjelica to win. Tonight, both teams played a very serious game with high intensity. All the players who were on the court tried to give their best attitude and concentration. we had a problem in the first 20 minutes, because we made too many turnovers, 11. In the second half only 3 as we improved our shot selection. This is the reason that we won the third and fourth quarter. Let's say we won the second half, which is for us important. We didn't play our best all the time, but it was a good game for us." "We are in the Top 16. I would like to thank out fans for their support in this first phase. We will need their support in the Top 16. It is very difficult for any team to play against us in here. We need to be focused in the next round."